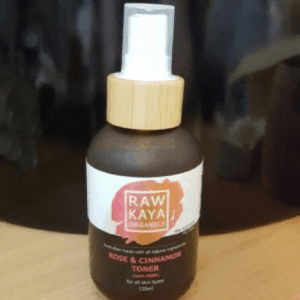 Over the last month, I have been trialing a new skincare range by Raw Kaya Organics, an Australian natural skincare brand. There are 2 different ranges within the brand to choose from – Mandarin & Honeysuckle for normal to combination skin, or Rose & Cinnamon for all skin types. There is also a Coffee & Lychee Seed Scrub which can be used in conjunction with both of the ranges. My skin is quite sensitive and prone to dryness and dehydration, so I tried out the Rose & Cinnamon range. Below I will review each of the 4 products and follow up with my thoughts overall. ‘A luxurious creamy cleanser for normal to dry, and mature skin. My Thoughts – I usually find that a cream cleanser is quite thick and a little too much for my skin. With this one though, it was so light and felt great on the skin. When I removed with water, my skin was left feeling smooth and more hydrated. On the Bottle – ‘Slow down and smell the roses. My Thoughts – First of all, this has some amazing ingredients in it! And the fact that it has that anti-inflammatory factor – fantastic for mornings or after a rough day. Using after the cleanser, it definitely reduces the appearance of my pores. My skin did also feel that little bit softer. However, I found the scent a little too much for me. My thoughts – This feels absolutely beautiful on the skin. I couldn’t believe how soft and hydrated my skin looked. It actually had a slight glow. Even washing it off didn’t take away from that feeling. This is a standout among the products I tried! My Thoughts – This does what it claims. It exfoliates the skin well, removing dead skin cells and any dry, flakey skin. For those with sensitive skin, I would suggest skipping this step. Just because it is quite a harsh scrub due to the coffee seed. For those with normal skin, twice a week is all you need. Overall, I think these products are great. If you can find a product that is all natural, not overly expensive and works… you can’t go wrong. I personally love the product packaging, especially the pump bottles on the cleanser and moisturiser. Besides being very hygienic, you can recycle the bottle for other products you have at home. As with everything, we all react differently. I suggest patch testing each product before applying to the face to avoid any problems. If you are highly sensitive to scent, the Rose & Cinnamon may not be for you.